A Professional machine quilting business owned by Sharon K. Jack. It is located in my country home in Central Illinois. I use an A-1 longarm quilting machine with a stitch regulator. 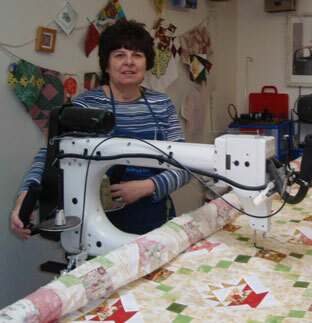 A quilter since 1999 with a longarm machine. I attend longarm classes and lectures regularly to keep up with the latest techniques and information. I attend trade shows to keep up with latest in patterns and threads. I am a member of the International Machine Quilter's Association(IMQA), American Quilter's Society(AQS), and a group of longarm quilters in Central Illinois. I also belong to the following groups Quilts Etc, Neoga Quilt guild, Sew Happy Stitchers sewing group. I enjoy taking your quilt tops and creating beautiful finished quilts. I have expanded my business to hosting retreats and offering quilt classes and lectures. You may contact me with any questions about this business, web site, or general quilting questions.